Have you found yourself wondering about the Newfoundland Lab Mix? Would one be the right addition to your household? 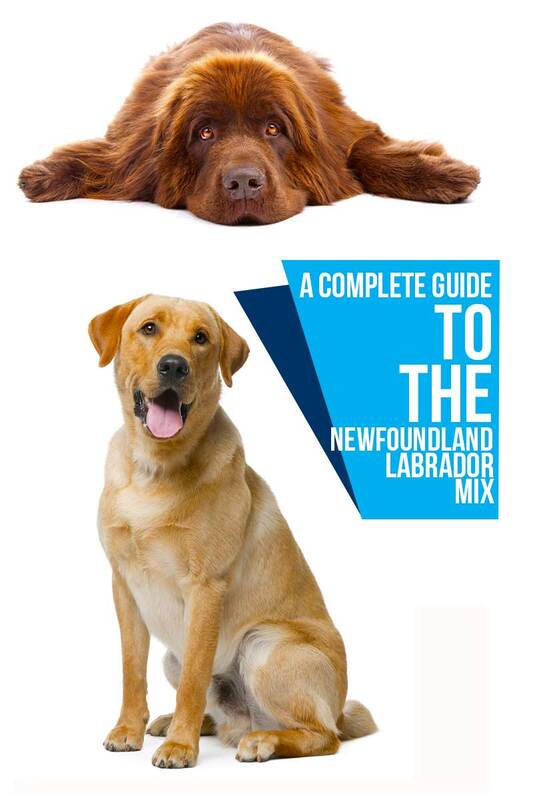 In this article, we’ll explore everything you need to know regarding the Newfoundland x Labrador Mix. So what exactly is a Newfoundland Lab Mix dog? The Newfoundland Lab Mix is the offspring of a purebred Newfoundland dog and a purebred Labrador Retriever. In the dog world, the Newfoundland Lab Mix is known as a crossbreed. So What is a Crossbreed? A crossbreed, sometimes referred to as a “designer dog” or a “hybrid dog,” is the offspring of two purebred parents, such as the Newfoundland and the Labrador. While some support crossbreeding and insist there are benefits to breeding two different purebreds, others disagree. For example, some experts consider crossbreeds and mutts to be one and the same. Others insist that mutts share a lineage of several different breeds. Crossbreeds are the descendants of only two purebred parents. More importantly, many supporters claim crossbreeding can be a solution to the generational health problems that have increasingly overwhelmed purebred dogs during the last few centuries. However, others say that genetic defects can be just as prevalent in crossbred dogs. You can learn more about the controversies of crossbreeding here. When deciding to add a new dog to your household, always do as much research on the desired breed—or crossbreed—as possible! Because crossbreeding is still a relatively new experience, the origin of the Newfoundland Lab Mix is mostly unknown. However, both of his purebred parents have fascinating histories worth digging into! Let’s begin with the Newfoundland. The Newfoundland dog is a part of the Mastiff family. He originated in Newfoundland, a large Canadian island off the east coast of the North American mainland. He is believed to be descended from the St. John’s Dog, which was a breed indigenous to the island. The Newfoundland was officially recognized by the American Kennel Club (AKC) in 1886. The Newfoundland is a massive dog, mostly bred for working. Because of his large stature, he was extremely useful in hauling heavy fishnets and pulling carts. There are many stories in the Newfoundland’s history telling of his bravery and courage, describing his lifesaving adventures and exploits. In fact, a black Newfoundland named Seaman is said to have accompanied Lewis and Clark on their voyage to America! So what about the Labrador? Is his history as valiant? Much like his Newfoundland counterpart, the Labrador originated from the Canadian island of Newfoundland in the early 1500s. Still, the name “Labrador Retriever” did not become commonly used in England until 1870. The Lab was officially recognized by the AKC in the United States in 1917. Today he sits at number one as America’s most popular dog breed! The Labrador is mainly bred for hunting, but is best known to be a devoted companion to his human counterparts. The Lab enjoys a good day’s work. They can often be seen working narcotics detection with K9 officers or even guiding search-and-rescue missions. Labs can also make excellent guide dogs for the blind. Because the Newfoundland Labrador Mix is a crossbreed, it is difficult to determine what type of temperamental traits he could inherit. 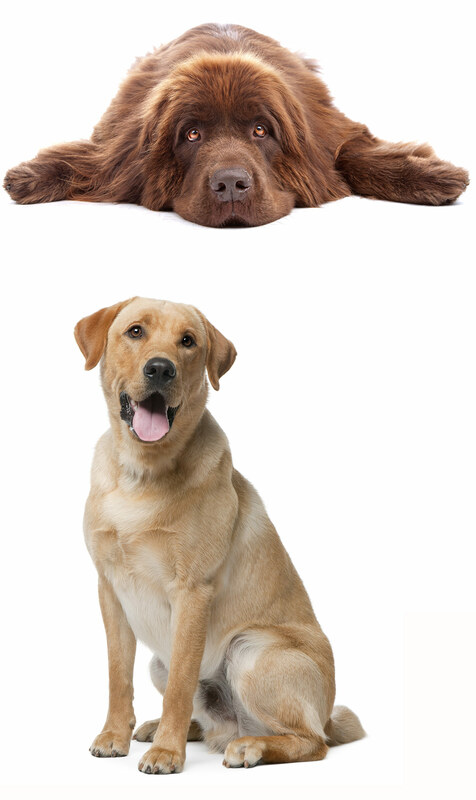 By looking into the behavioral traits of the Newfoundland and the Labrador, we will be able to get a general idea of what the Lab and Newfoundland Mix temperament could be. The Newfoundland is a gentle giant, known for his devotion and sweet nature. He is excellent with children and is eager to please. Still, it is best he is supervised around other dogs and family pets until they have been properly introduced. The Newfoundland is an intelligent dog with a slightly independent streak. Because of his loyalty and keenness to please, he is easily trainable. The Labrador is a famously intelligent dog, who is also eager to please and therefore easy to train. Labs make excellent family dogs and do well with children and other pets. Labs can be prone to chewing, however. They will need a variety of toys and chew bones to help reduce the chance of boredom that could result in material damages. Labradors are also highly energetic. They require consistent exercise and enjoy partaking in all sorts of family activities. The Newfoundland Labrador Mix will most likely do well with children and will have a loyal, sweet disposition just like his two purebred parents! The outcome regarding things like coat color, size, and weight, can be unpredictable when dealing with crossbreeds. These dogs can inherit physical traits from either purebred parent. 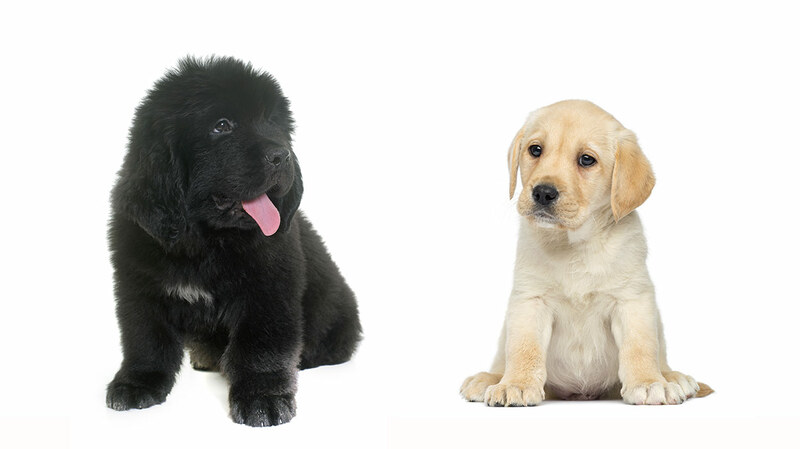 We can’t be sure of the Newfoundland Lab Mix size until we look at the individual parents. However, taking a closer look at the defining characteristics of the Newfoundland and the Labrador can help give us an idea of what your potential Newfoundland cross Labrador puppy could inherit. The Newfoundland is a very large dog with females growing to about 26 inches tall and males growing up to 28 inches. A full-grown female Newfoundland can weigh in at 100–120 pounds while a male can weigh between 130 and 150 pounds. The full-grown Labrador will grow to be 22–25 inches and weigh about 55–80 pounds. Generally, we can expect the Newfoundland Labrador Retriever Mix to be a medium to larger dog. We do have to keep in mind that physical traits will vary based on what he inherits from his purebred parents. Generally speaking, the Newfoundland Lab should be easy to care for, as both his purebred parents only require occasional bathing. Still, both the Newfoundland and the Labrador are seasonal shedders with similar weather-resistant coats. The Newfoundland Lab Mix will most likely require weekly grooming and brushing to help keep his coat looking its best. Keep in mind the Newfoundland has a thicker coat with longer fur. If your Newfoundland Lab Mix inherits that coat, he may need more grooming attention, especially during warmer seasons. The Newfoundland Labrador Mix will need his ears cleaned once a week to help avoid infection. He will also need regular trimming of his nails to avoid cracking and splitting. Both the Newfoundland and the Labrador are intelligent, loyal dogs who are eager to please. Training their offspring, the Newfoundland Lab Mix, should be a breeze! Both the Newfoundland and the Labrador enjoy having access to the outdoors. Daily walks or frequent visits to the dog park would make for great exercise opportunities for your Newfoundland Labrador Mix. Potential owners should prepare for an independent streak in their Lab Newfoundland Mix when it comes to training. Approach obedience coaching with patience and dedication to ensure a positive experience for both of you. As always, we recommend early socialization and proper training with any new dog. A healthy Newfoundland Labrador dog could have a lifespan anywhere between 8 and 12 years. Because he is a crossbreed, it is important to consider the lifespan and health issues that affect his purebred parents. The Newfoundland’s average lifespan is 8–10 years. He can be prone to several serious health conditions, including subaortic stenosis, hip and elbow dysplasia, gastric torsion, and epilepsy. He has also been known to suffer from cataracts. Some Newfoundlands do not tolerate anesthesia well, and many are sensitive to heat. The Labrador’s lifespan is anywhere from 10 to 12 years. Labradors can suffer elbow and hip dysplasia, loose knee joints, ruptured ligaments in their hind legs, heart disease, eye disease, epilepsy, cancer, and chronic allergies. Labs are also more prone than average to suffer from the gastrointestinal syndrome, bloat. Another thing to keep in mind is that both the Newfoundland and the Labrador are prone to obesity. It’s important to remember that even with proper health screening, not all health issues are avoidable. Regular vet checkups along with a healthy diet and plenty of exercise can help extend the Newfoundland Lab Mix life expectancy. Both the Newfoundland and Labrador enjoy being outside. Potential owners can expect their Newfoundland Lab Mix to share the same sentiment. An ideal home for the Newfoundland Labrador Mix is going to have plenty of access to the outdoors. This includes trips to the dog park, walking along paths, and swimming in lakes and streams. The Newfoundland breed in particular loves water, so the Newfoundland Lab Cross might just love it too. The Newfoundland Lab Mix is a larger dog, however, so space could be an issue—he will need plenty of it. If you want a dog who loves to be right in the thick of the family fun, then the Newfoundland Labrador Mix will fit right in! Whether you have your heart set on a rescue or a breeder, the most important thing is to go through a reputable source to ensure the health of your Labrador Newfoundland Mix. Finding a new dog from a responsible source can sometimes be difficult, so give yourself time and do plenty of research before you find your Newfoundland Lab mix for sale. Shelters carry all types of crossbreeds, but they may not have the one you are looking for there at any given moment. Many shelters offer waiting lists and can call you when and if your desired breed or crossbreed arrives. One of the many advantages of rescuing from a shelter is the price. Although most shelters do incur fees, they are often a fraction of what some breeders will charge. Also, most shelters will cover the initial veterinarian fee. Most adoption fees from a shelter can be from $50 to $100. Researching the local shelters in your area can help lock down more specifics on pricing. If you are looking to get your puppy from a breeder, be ready to spend anywhere from $500 to over $1,000. The price will depend on the breeder and the history of the Newfoundland Lab Mix’s purebred parents. We recommend doing plenty of research on the breeder before you buy and make sure you research the Newfoundland Labrador Mix. Always make sure to ask about any temperament or health issues with his purebred parents or previous litters. Keep in mind that reputable breeders will have certificates to prove their dogs have been health screened. If you are still wary about getting your Newfoundland Labrador Mix, attend local dog shows. You can meet many breeders in person who could help point you in the right direction. You can also locate a breeder by going through your local AKC club. To find a club in your area, visit www.AKC.org. Is a Newfoundland x Labrador Mix Right for Me? As we’ve gone over, the Newfoundland Labrador Mix is a wonderful family pet who enjoys the outdoors and loves children. He is a very large dog who requires lots of space and access to the outdoors. He also needs an owner who is able to offer him plenty of exercise, weekly grooming, and a healthy diet plan. If you enjoy being outside or love to swim, the Newfoundland Lab Mix will make a great companion for you. He’s an intelligent dog who is easily trained and does well in homes with children.